I consider myself to be a pretty hand guy so when it comes to power tools I have good working knowledge of the type of features to look for. In the case of chainsaws it isn’t really complicated. You need a reliable machine that starts every time, has built-in safety features, and does a good job of tackling most typical wood cutting jobs. That all may sound fairly straightforward, but unfortunately there are a lot of poor quality products out there so it pays to do your homework. A friend of mine bought a chainsaw last summer because it was on sale. That was his only criteria. Unfortunately for him, the reason it was on sale for such a great price was because it had an unreliable reputation. It turned out to be not much of a deal at all. 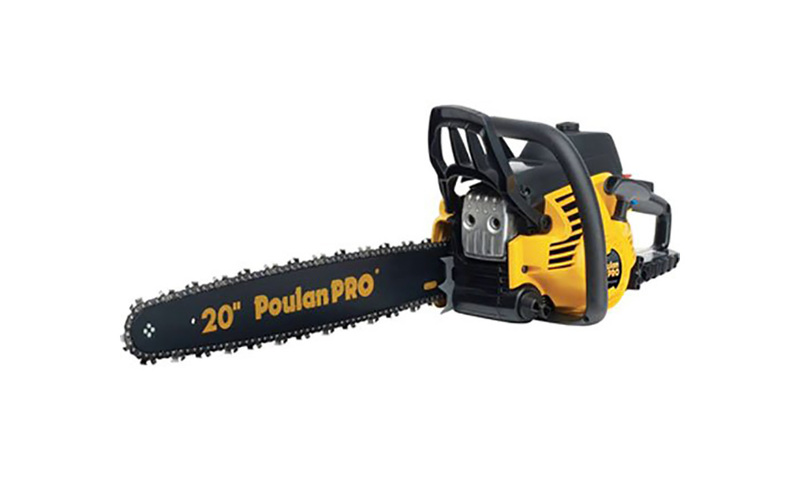 When it comes to reliable outdoor power equipment Poulan Pro is a name that stands out, and the PP5020AV is one of their most popular chainsaws. If my friend had purchased one of these he wouldn’t have had the terrible experience he had. Best of all, this model is affordable as well, at less than $300, so he wouldn’t have had to wait for it to go on sale. Any tool with a small engine is bound to work a little harder than a larger machine. That’s why it’s important to look for a chainsaw with a reliable and durable engine. The PP5020AV is designed for longer engine life. It comes equipped with a long lasting DuraLife engine that’s as good, if not better, than most engines in comparable products. With proper care and maintenance you should be able to keep using this chainsaw for years. Even small engine tools need a good air filtration system and this Poulan Pro model doesn’t disappoint. Its SuperClean air filter is designed to keep the chainsaw engine operating at the peak of its performance capability every time you use it. You still have to be diligent to make sure it doesn’t get clogged, but as long as you do your part this machine will there when you need it. How Long is that Blade? There aren’t too many chainsaws at a similar price point to this one that can boast a 20-inch blade bar. My parents have a pear tree in their back yard and some of the higher branches are just out of my reach without a ladder. With the extra reach that the PP5020AV provides those higher branches would easily be in reach without a ladder. That’s a good thing if you don’t have the best balance, like me. Anytime I can avoid using a ladder is a good thing. This Poulan Pro chainsaw does have a gasoline-powered engine so you still have to use a pull start system to get it going, but by most accounts that not much of a problem with this model. In most instances it will start on the first pull, minimizing the strain on your body. For anyone that has ever thrown their shoulder out trying to get their lawnmower started, this will be welcome news. I suffer from a condition called Repetitive Strain Injury; anyone that has to live with this knows that the prospect of having to use power tools is likely to fill them with dread. That’s why a chainsaw like this one that’s designed to reduce the level of vibrations is ideal. It has soft cushioned handles and a well-protected motor housing that effectively eliminates most of the vibrations produced. A dry, rusted chain is something that will give any handyman nightmares. That’s because a chainsaw with a poorly maintained chain will not operate well and will do a poor job of cutting through wood. This saw has an automatic chain oiler that helps to keep the chain lubricated and in good working order. It helps to take the guess work out of the process and it’s great for peace of mind as well. One of the best ways to properly maintain power tools is to make sure they’re put away in a safe, dry place when not in use. With this in mind, Poulan Pro has included a protective carrying case for storing your chainsaw in when it’s not in use. This will ensure that it stays in the best possible condition for as long as possible. Older model chainsaws were notoriously difficult to maintain. If you didn’t have the right tool on hand when a problem occurred, you were out of luck. The PP5020AV allows for tool-less access to both the air filter system and the spark plugs. This makes this machine a lot easier to repair than many of its competitors’ models. There have been a few complaints about the quality of this product. Typically, these involve difficulty in getting it to start and a problem with parts wearing out quicker than expected. While it does come with a one-year warranty, that’s probably not long enough to make most people comfortable. As a general rule I won’t recommend any power tool that doesn’t come with at least a two-year warranty. I do like a lot of the features of this chainsaw. The automatic chain oiler and anti-vibration technology are welcome additions, but the number of complaints customers have lodged against this model are hard to ignore. If it had a longer warranty I might be more inclined to recommend it, but a 1-year warranty simply isn’t long enough. I’d hold back on this one, as there are better options available at a similar price point.